On January 27th we hosted our first mediation training of 2017. At the training participants learned how to build effective alliances in the mediation process across multiple backgrounds and experiences such as race, gender expression, class, age, disability, nationality, or whether you are from a rural community or an urban center. 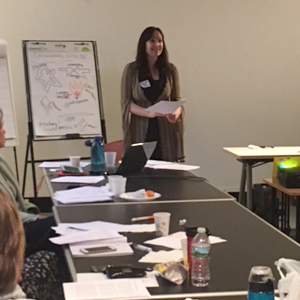 Participants learned to increase their awareness of their own social backgrounds and how their backgrounds relate to their work as mediators and beyond. Guided by Trainer Jac Patrissi, participants learned how to effectively and compassionately address the varying levels of exploitation, marginalization, and powerlessness that exist within the diverse communities we serve. It was a pleasure having Jac Patrissi – pictured here on the left with our Vice President of Mediation Services Regina Ritcey and CEO John Harrison – deliver the training and we are excited to see our mediators put these skills they learned into action. If you are interested in becoming a mediator or want to know when our next mediation training is, contact Leslie Funk at 718-523-6868, x305, or lfunk@mediatenyc.org.